WorldWideWebSize.com estimates there are at least 4.58 billion pages on the internet as of October 29, 2017. You generally need a minimum of 300 words per page for SEO purposes. This means your visitors can wade through more than a trillion words on the internet. How can you compete against those numbers and improve your conversion rates? It’s not enough to fill your content with keywords and hope for the best. You need to generate engaging, compelling copy that grabs readers’ attention. 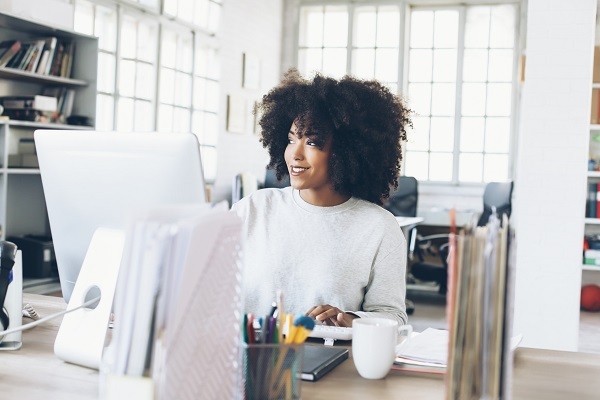 And the quickest, easiest way to make your content shine is to run it through a comprehensive editing tool that checks for more than just grammar mistakes. A tool like ProWritingAid offers stylistic suggestions to make your words pop and sizzle. Because you’ll turn off visitors to your website with a weak style and convoluted readability. The good news for the average writer? You don’t need an English degree to write solid content. You just need to optimize your copy with an editing tool. How does an editing tool work? The mechanics behind the tool involve complex algorithms that compare your content to hundreds of thousands of published texts. You then get a Summary Report that details the key actions that will take your writing to a higher standard. Let’s look at some of the individual reports. Readability is calculated using a combination of words per sentence and syllables per word. The score corresponds to US school grades, so a grade of 12.0 means you’re writing at the level a senior in high school would understand. 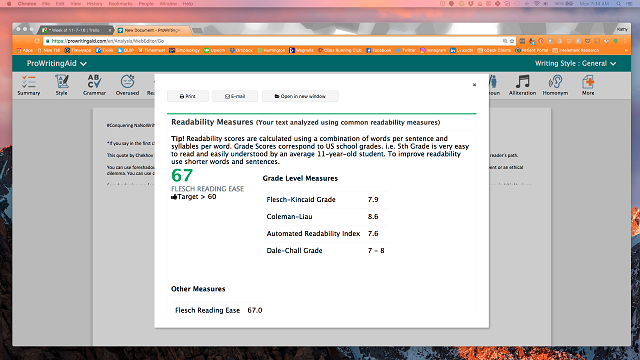 To improve your content’s readability, use shorter words and sentences that an average middle schooler can understand. Sentence structure has a big impact on how engaging your content is. The longer the sentence, the more difficult it is to read. To keep your readers engaged, vary your sentence lengths. A good editing tool will graph how your sentences flow so you can visually find where you need variety. Common style issues include passive voice, hidden verbs, and adverb overuse. On your own, these mistakes can be hard to identify. With an editing tool, you’ll get a report in seconds that shows you exactly where you’ve made these errors. 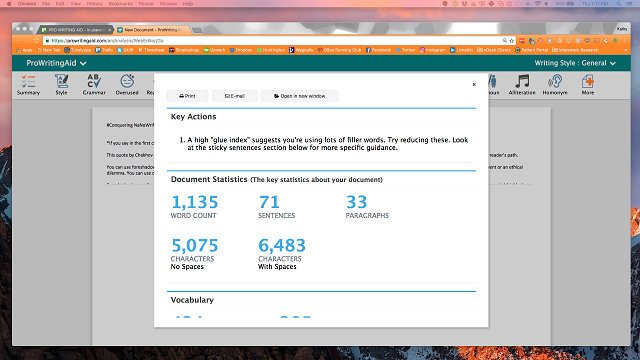 The report will also show you the most used adverbs in your content so you can see the effect. 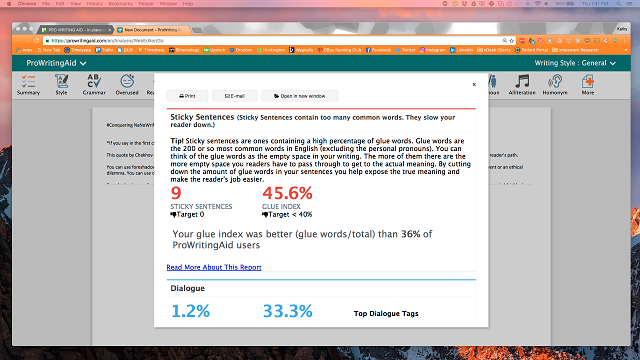 Sticky sentences are made up of too many glue words. Glue words are the most common words in the English language such as “of,” “the,” “on,” “to,” “like,” etc. Glue words merely take up space; they don’t help your readers understand your meaning. You should rewrite sticky sentences to increase clarity. When you structure your content to persuade someone, transitions link your sentences together to form a flowing, cohesive structure that leads your reader. An editing tool will measure your content for adequate transitions to let you know if you need more. It’s hard to notice when we repeat certain phrases in our writing. An editing tool finds the top 3-, 4-, and 5-word phrases you use most. You determine if you need to replace any of them with more original phrasing. Some words don’t help your readers understand your meaning; they’re too vague and abstract to convey concrete ideas. Use an editing tool to instantly show any vague or abstract words so you can replace them with stronger ones. When you create high quality content, you enhance your visitors’ experience. And when you nail the visitor experience, your conversion rates will increase. Guaranteed. The worst thing you can do is copy and paste content from other places. Not only is that plagiarism, you’re not offering your visitors something unique and descriptive. Your best bet? Use an editing tool to make your content the best it can be. There are some great online tools, but the most comprehensive one is ProWritingAid. However, don’t be afraid to experiment with the tools available though to find the one that works best for you. Next Post SEO or PPC – Which is Better for My Business?